Jimmy Ryan will not let his fond memories of former club Chesterfield stand in the way of his quest to help Fleetwood Town grab another vital three points today. Midfielder Ryan helped Chesterfield clinch promotion from League Two in 2014 and was part of the side that reached the League One play-offs last term. But after a successful two-year stint, 100 appearances and eight goals for the Spireites, Ryan joined Town in the summer of 2015. Now with both sides just two points apart and in the midst of a relegation battle, Ryan is keen to end Town’s run of three straight defeats after back-to-back losses to Burton Albion, Walsall and Barnsley. It is the 27-year-old’s first return to the Proact Stadium and he is not sure what sort of reception he will receive from the home fans. He said: “I’m not really sure how the fans will react to me. “Obviously when you leave a club some fans don’t like you – which you can understand – I’m a fan too and when players leave you don’t like it. “But you have to move on. It wasn’t right to stay but I’m looking forward to going back and seeing some familiar faces. “I have got fond memories of the place so it will be nice to go back there and see the familiar faces but obviously we are going back there to do a job. “You’d rather get a clap but when the game goes on it doesn’t really matter.You are on the pitch and you don’t really focus on your surroundings at all – it is just down to yourself and your focus on the pitch. 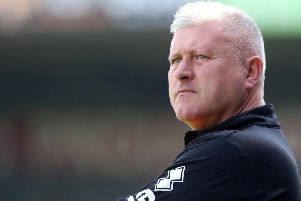 “I had a good two years there, promotion in the first and a successful second year getting into the play-offs but obviously after that it didn’t work out whilst sorting the contract out and staying there. “Everyone has their thoughts on that but only certain people know that what has gone on there, so I’m just going to have to go down there and do my thing and hopefully we get a win. “We are both at the bottom of the table with only a point or so between us and there are only nine games to go now. Ryan has only netted three times this season but has not ruled out celebrating if he does score the winner. He said: “It is an important game for Fleetwood, I haven’t scored many goals this season and I would like to say I wouldn’t celebrate – but I wouldn’t say you can keep your emotions down when you score a goal. “I loved it at Chesterfield, I loved every minute of it, I made some really good friends, it is the most successful club I’ve been at, regarding promotion and the play-offs, so I can’t look back at the last two years with any anger at all. This time last season, Ryan was in a battle at the top of the league as Chesterfield fought for a play-off spot. But the midfielder says that if Town survive this season there is no reason why they cannot be challenging at the other end next term. He said: “The emotions are different, the pressure is different but at the end of the day that is football – you have ups and downs and you have got to stay on an even keel. “When you are going for promotion you can’t think you are the best thing since sliced bread and then when you are down there you can’t think you are a rubbish player. Young Scot Thomas Grant has started the last two games alongside Ryan and Eggert Jonsson in a midfield three. And Ryan praised the former Falkirk player. “He has come in – not at a great stage, when the team is struggling – but he has got on the ball and he has been brave for a young lad. All the credit to him.